When I read a recipe for Meatballs and Spaghetti on Smitten Kitchen, I knew I would have to try it. She said she had never found a meatball recipe that she really liked until she made this one, which is an adaptation of an Ina Garten recipe. Like Deb, I had tried other meatball recipes that were OK, but never quite what I wanted. I am happy to announce that this one is a keeper! 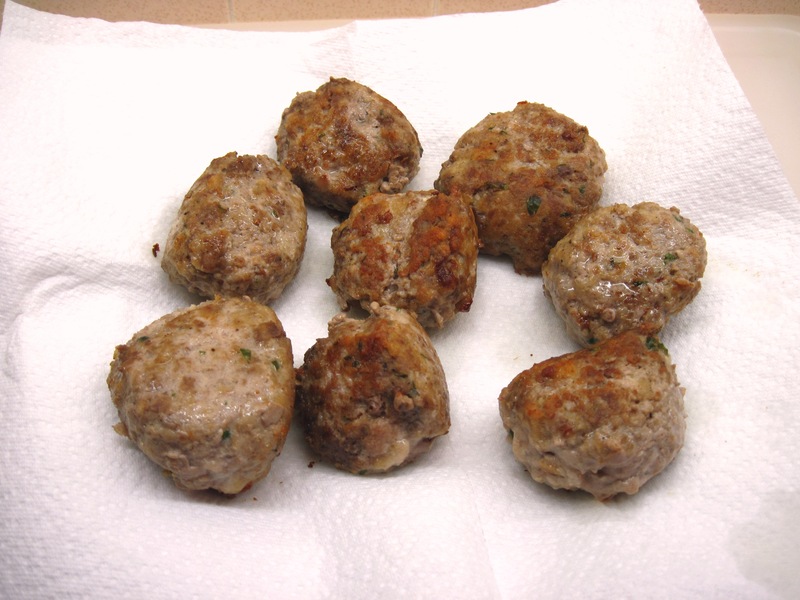 The Smitten Kitchen recipe serves 6 and uses 2 pounds of meat: a mixture of ground beef, ground pork, and ground veal. I wanted to scale the recipe down to serve 4 and decided that 1 pound of meat would be sufficient. I used ½ pound ground beef and ½ pound ground pork. The ground veal may have added another dimension, but I didn’t want to buy a pound of veal just for the ¼ pound I would need for the recipe. I took a look at Ina Garten’s recipe and noticed that there were many comments about how it was way too salty. Perhaps Ina had intended the recipe to be made with unsalted tomatoes? I added salt to my sauce because the tomatoes I used were unsalted. If you use salted tomatoes, I suggest omitting the salt until you have tasted the sauce; then season to taste. 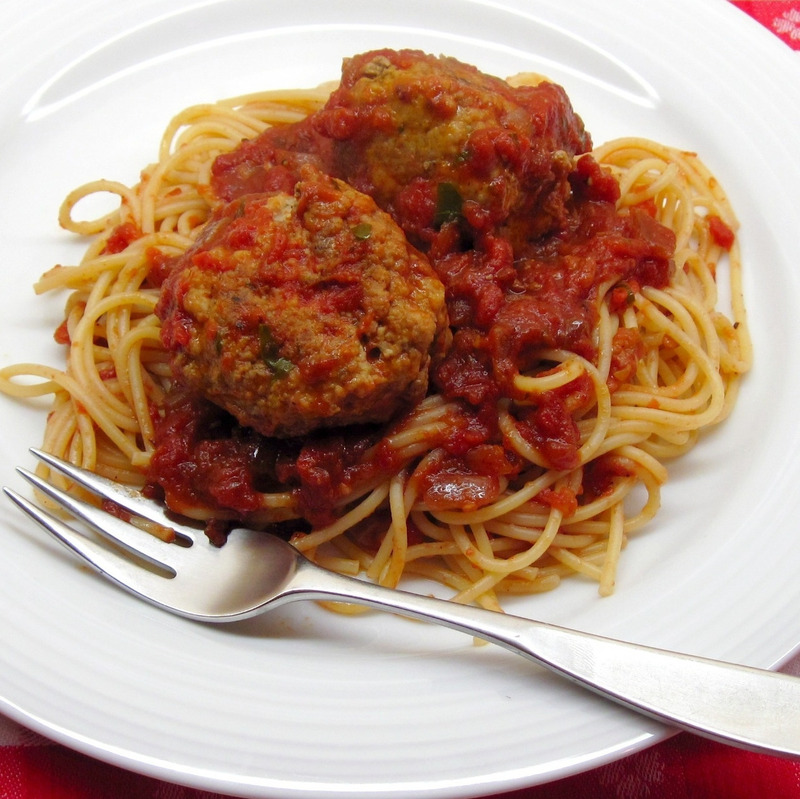 My Meatballs and Spaghetti was terrific for dinner last night and perhaps even better leftover for today’s lunch! Frank Fariello (Memorie di Angelina) wrote an interesting post about the best canned tomatoes to use for Italian tomato sauces. Apparently, American manufacturers add calcium chloride to canned tomatoes so they will stay firm, which is not what you want when making a tomato sauce. You want tomatoes that will “melt” into the sauce. He suggests using crushed tomatoes if you can’t find Italian tomatoes without calcium chloride. 1. Put the ground meats, bread crumbs, parsley, Parmesan, salt, pepper, egg, and water in a bowl. 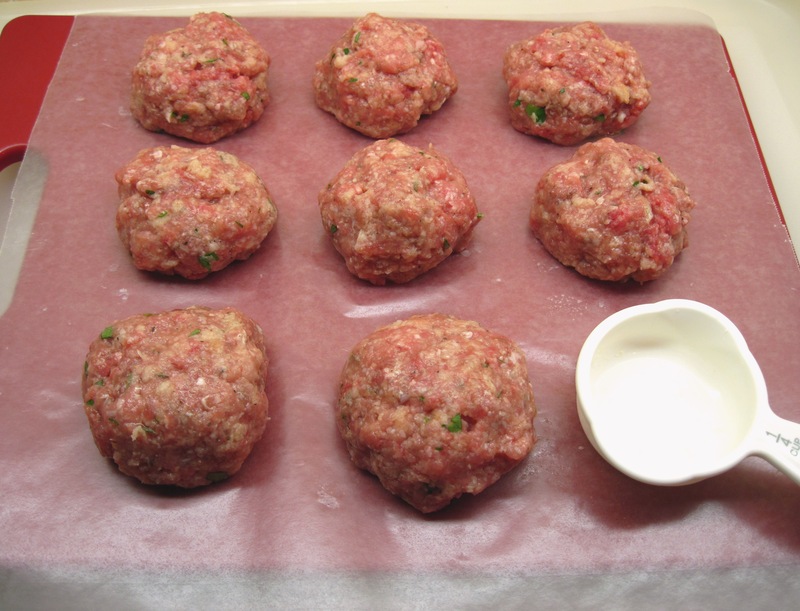 Mix together (using your hands works best), and then use your hands to lightly form 8 meatballs without compressing them. 2. Heat about 1/8 inch of oil in a large skillet over medium heat. 3. When the oil’s hot, add the meatballs to brown on all sides. Turn them gently with a spatula. 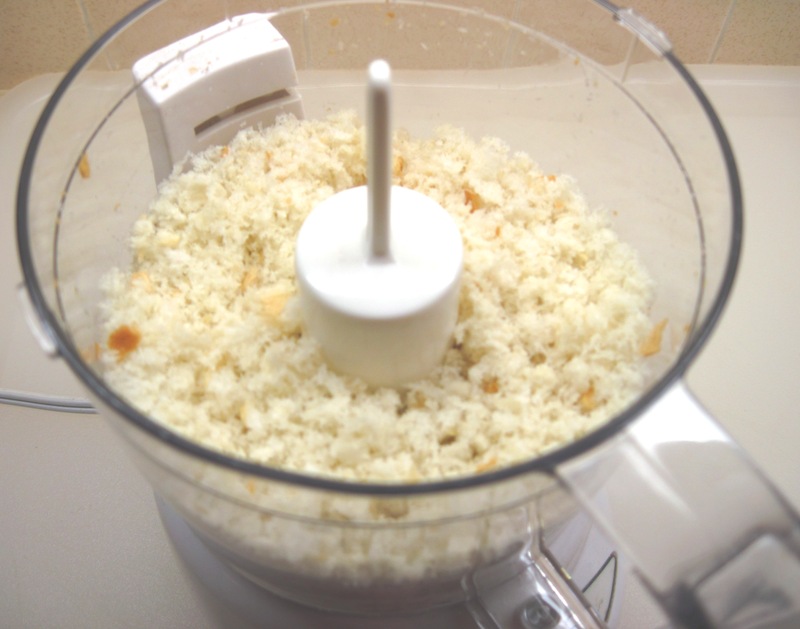 It will take 10 – 15 minutes to brown them. 4. Put the meatballs on a paper towel on a plate. 5. Pour off almost all of the oil in the pan, leaving the browned bits and about 1 tablespoon of oil. 6. Add the onion and cook, stirring occasionally for about 10 minutes, until softened. 7. Add the garlic and red pepper flakes and cook, stirring, for 1 minute. 8. Add the wine and turn the heat to medium high to bring to a boil. Scrape up the bits on the bottom of the pan and cook until almost all of the wine is evaporated, 2 – 3 minutes. 10. 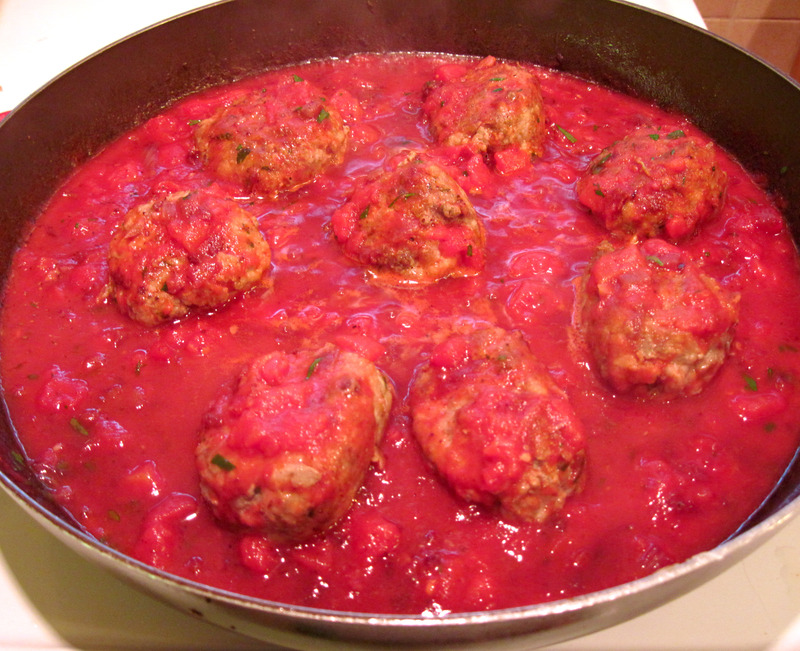 Carefully put the meatballs in the sauce and spoon a bit of sauce over them. 11. Cover and turn the heat down to low so the sauce is barely simmering and not boiling. Cook for about 15 minutes. 13. 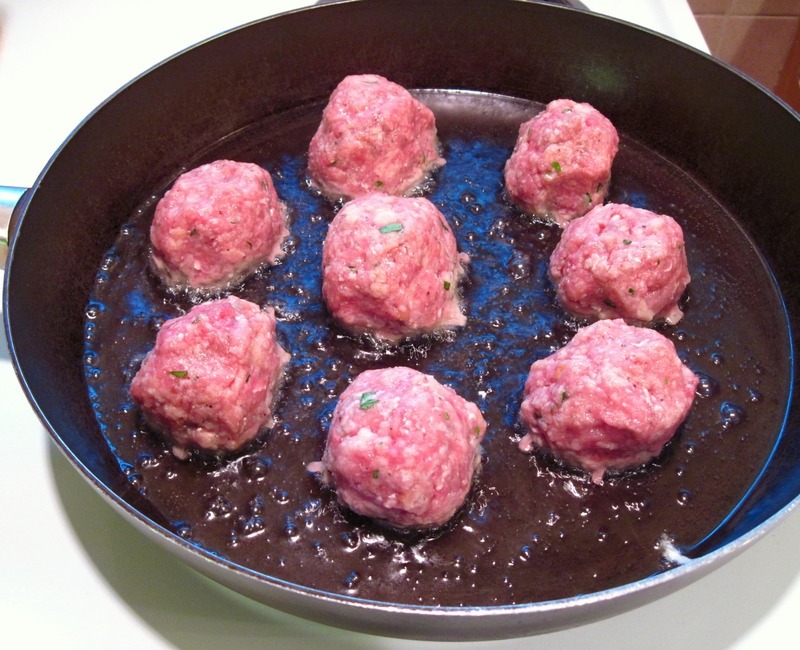 While the meatballs and sauce are simmering, heat a large pot of water for the spaghetti. 14. Cook the spaghetti according to the package directions. Drain and put it back in the pot. 15. Use a small amount (about ¼ cup) of the tomato sauce to toss with the pasta. 16. Serve the pasta, and top with a bit of sauce and a couple of meatballs. 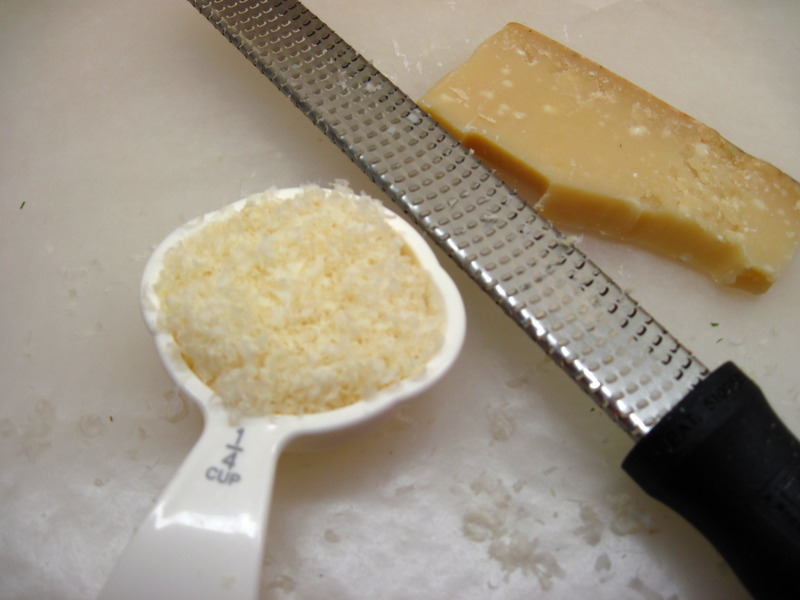 Pass the Parmesan at the table. 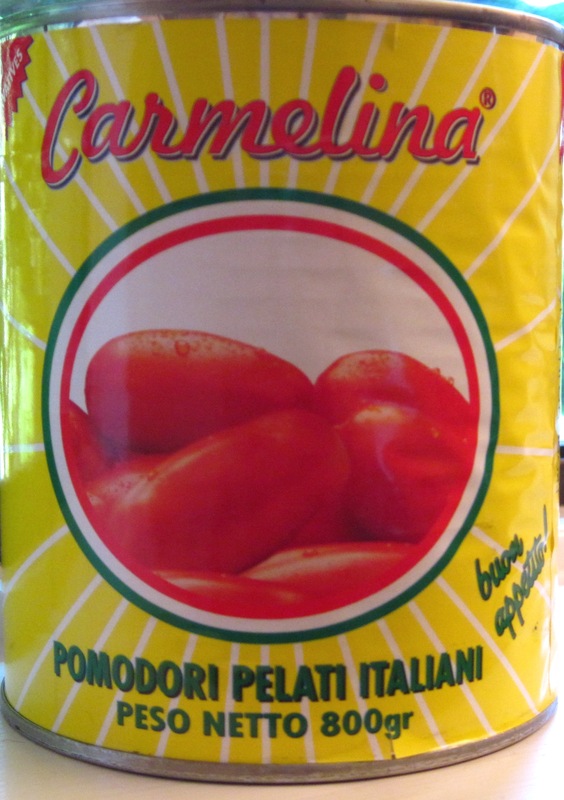 I find tha Cento Italian DOP San Marzano canned tomatoes are the best I’ve found. The DOP designation means they were grown and processed in San Marzano, Italy. I’ll have to look for the DOP designation, Phyllis – thanks for that tip! I have used Cento tomatoes and they are excellent. 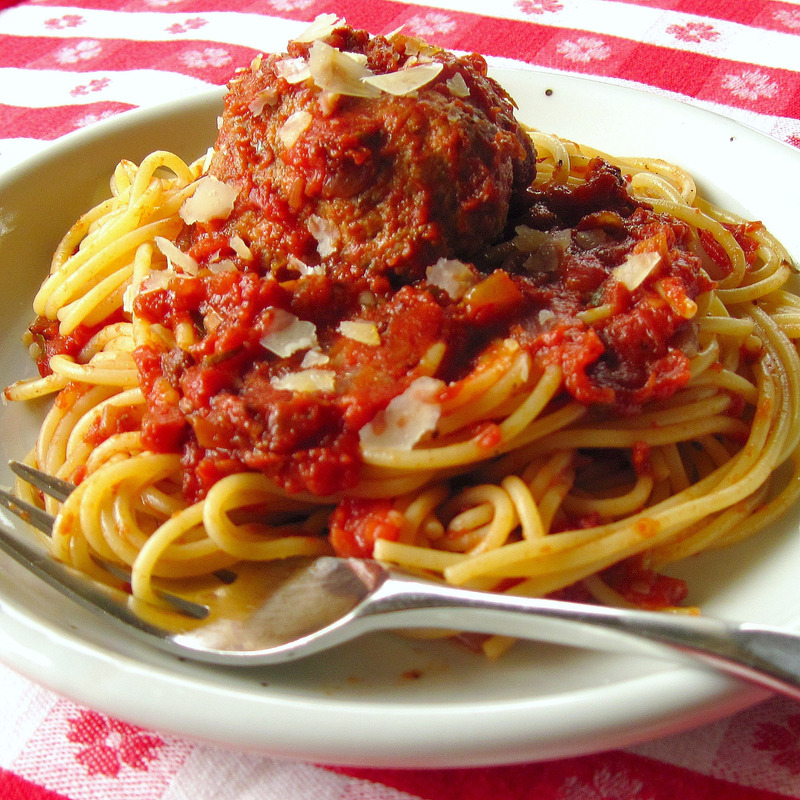 I love spaghetti and meatballs! Yours looks delicious, and I’d love a plate right this minute!